For Open Access Week 2016, OBP published a series of blog posts by librarians, in which they shared their thoughts on Open Access books – all the blog posts can be read here. But we didn’t want the conversation to end there! 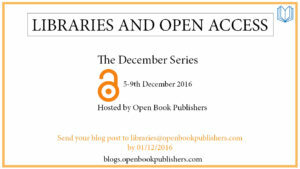 We are releasing a follow up December Series of Libraries and Open Access, and we’d love it if you participated! The blog post would preferably consist of around 500-700 words, discussing your thoughts on Open Access books – it doesn’t matter what your role within the library is, or the angle that you come at the post from; we just want to hear your experiences! If you’d like to participate let us know asap, and please send your blog post and a picture of yourself to libraries@openbookpublishers.com by 01/12/2016. Of course don’t hesitate to get in touch if you have any questions.